It’s been a while since I’ve posted on this blog. Sorry. I’ve been spending a lot of time helping new and soon-to-be teachers on my other blog, SucccessInTheClassroom.com. I am excited, however, to be able to share something that has helped me take a giant leap forward in my journey toward school administration mastery. In the last few months, I have been really focusing on my self-development. I have been reading books, listening to podcasts and audiobooks. I’ve even been exercising every morning and eating better. This focus on improving myself has made me a better leader, friend, co-worker, husband and father. I enjoy life a lot more. I smile more. I help more people. It’s been amazing. That is why I’m writing this post. It’s something that I need to share with others who are looking to find more success, especially in their position of school administrator. I’ve been doing a lot of reading in the last few months. I used to read books by James Patterson or Bernard Cornwell, and I’ll still take a little time to read fiction, but I have spent most of the last few months reading books about leadership and success. I have learned so much, and in the last three months, I have moved closer to school administration mastery than I had in the last three years. It’s all about making time to read. I know in our busy lives, finding time to sit down with a self-development book just isn’t easy. We have so much going on, and we get home so late, we really would rather spend time with our family than to isolate ourselves with a book. This was my problem. I knew I needed to read more. I knew I was too far away from my goal of school administration mastery, but I just didn’t have the time. Then I read a book that changed all that, and at the same time, changed my life. That book was The Miracle Morning, by Hal Elrod. I’m not being paid to promote his book. I’m just sharing what happened in my life, and reading Hal’s book was the spark that ignited its transformation. Basically, Hal provides a program where you can use an hour in the morning before you go to work to focus on self-development. I said the same thing. I like my bed in the mornings, but I was determined to find more success in my life, so I made it a goal to wake up an hour earlier and try out some of Hal’s suggestions. As of this writing, I am on day 56 of getting up at least an hour earlier. It’s been great! I have read over 15 different self-development books, started exercising daily, I’ve written many posts, and I have even finished an ebook that I had started a long time ago. It’s actually in the Kindle store. This morning thing has been amazing. In my readings, I have learned so much about my role as a school administrator, and I have even begun to implement some of what I’ve learned at my school, which I’ll share in the next posts. One of the books that I have found so inspiring is Leaders Eat Last by Simon Sinek. This is one book, that if you’re looking for school administration mastery, you have to read. I was so inspired by this book, that I read it twice. Again, I’m not getting paid to recommend this book, but Simon’s book has clarified the way I see myself as a leader. It has given me new purpose, and I am excited about what I can do every day to move my school forward. I will be sharing more what I’ve learned from Simon’s book in future posts. In the meantime, consider the idea of Jim Rohn’s quote. 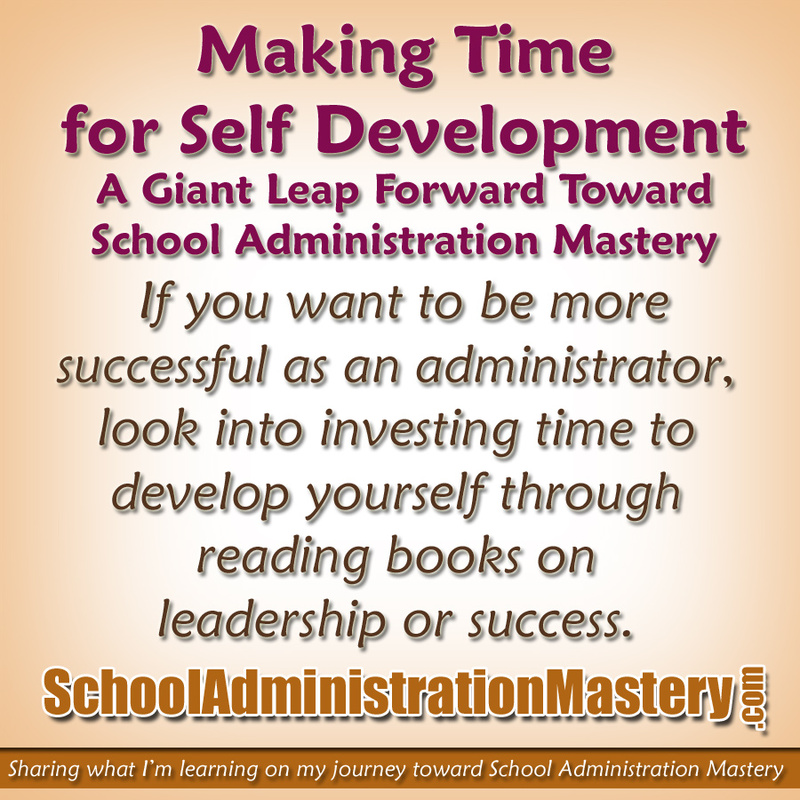 If you want to be more successful as an administrator, look into investing time to develop yourself through reading some books on leadership or success. 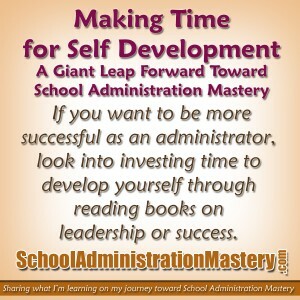 If you are like most school administrators, you don’t have extra time for reading, but if you see it as an investment in your future success, it will be a little easier to make the time. Follow me on Twitter. I’ll be uploading the next post soon.